An officer explains to reporters about some of the ship’s controls at the bridge. 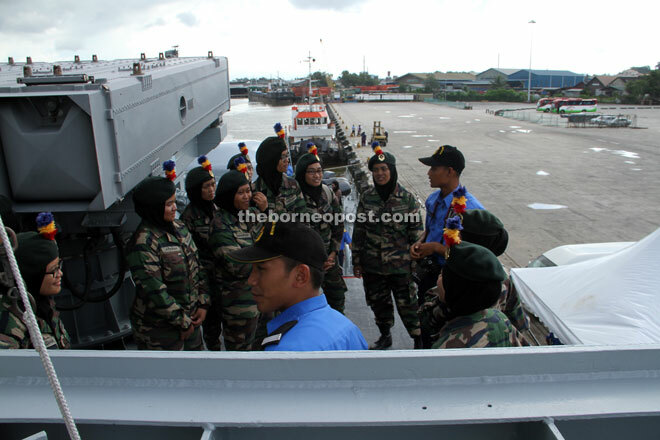 Visiting students from Unimas listen to Navy officers explaining the missile launcher. KD Laksamana Hang Nadim is in town until Jan 22, accompanied by KD Lekir (on the left). 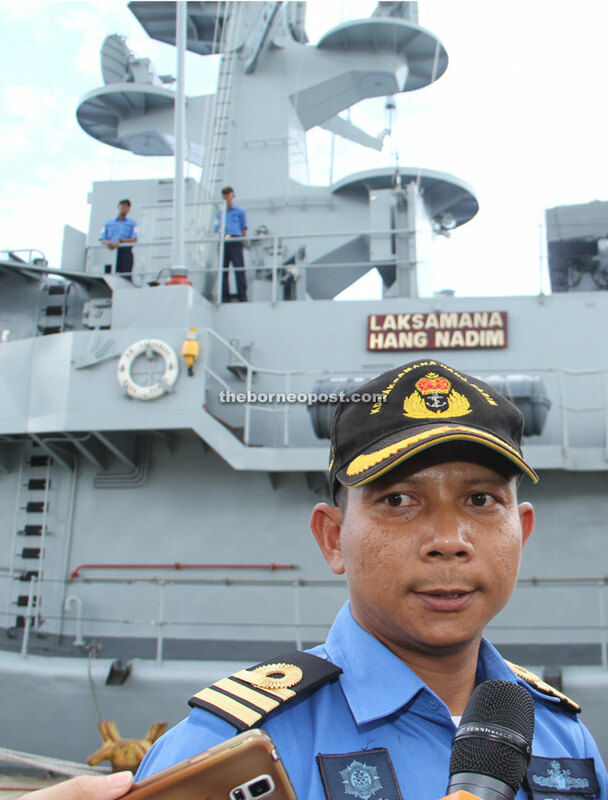 KUCHING: The waters off Sarawak are safe from external threats, says Rozlysham Yusoff the commanding officer of Royal Malaysian Navy warship KD Laksamana Hang Nadim. 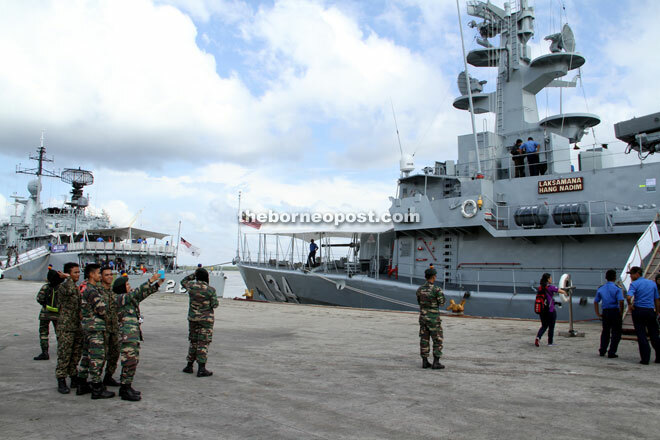 “We always come here to patrol the waters off Sarawak and Sabah, particularly after the Lahad Datu incident. “So far, we have no problem with external threats. The situation is well under control, and we are communicating with other enforcement agencies on a daily basis. “We also communicate on a friendly basis with other vessels in Malaysian waters. There is no silent or hidden threat. “We would therefore like the public to know that our waters are safe for all sort of activities, especially fisheries,” he told reporters during KD Laksamana Hang Nadim’s ‘Open Ship’ event at Kuching Port yesterday. Rozlysham said they were accompanied by another warship a Kasturi-class Corvette KD Lekir on this trip. “Our patrol usually lasts from one month to three months at most. We are also assisted by other ships. This time, we set sail from our home port in Lumut, Perak early last month. We will head home by end of the month. “Other ships will then replace our duty here. Rest assured, there are always ships patrolling our waters 24/7. “While in Kuching, we would like to show to the local people that we are also concerned about them, besides taking care of our seas. 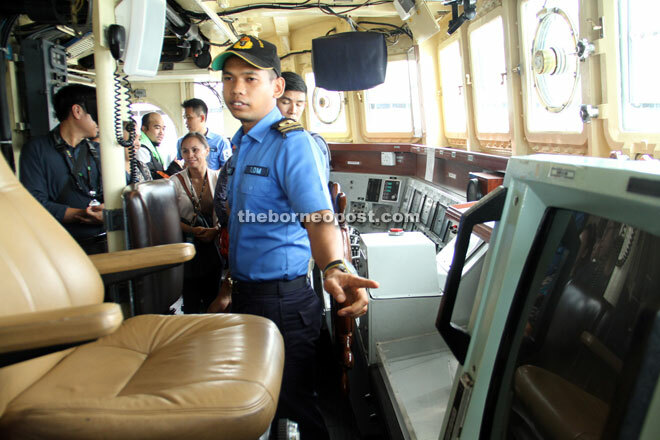 “We are having this Open Ship event so that the public can come and learn more about the roles of the Royal Malaysian Navy,” he said. The warships arrived on Jan 19 and will be here until Jan 22. The public can visit the Open Ship event any time until 5pm daily for an educational tour of the vessels. KD Laksamana Hang Nadim is an Italian-built Laksamana-class Missile Corvette, one of the most sophisticated warships in the Royal Malaysian Navy armada. It is armed with Otomat Mk 2 surface-to-surface missile, Aspide surface-to-air missile, Oto Melara 76/62 Super Rapid cannon, Breda Twin 40L70 Compact Gun cannon and A244S torpedo. It has 56 crew on board while KD Lekir has 146.